When most people train their shoulders, they usually include a number of exercises to work the front and side deltoids as well as the trapezius muscles, but the rear deltoids are often not incorporated into the workout. Yet it is simple to include rear delt exercises, and it is not uncommon for the front deltoids to be stronger from lots of pressing movements such as bench presses and overhead presses, therefore, they often overpower the rear deltoids. Most don’t realize how important rear delt exercises are as rear deltoids that are well-developed help to balance shoulders and prevent a number of shoulder injuries or rotator cuff problems. Strong rear delts also help improve your strength in exercises such as the bench press as you will be able to generate more power with a strong and well-developed back. They will also help with your squat as the bar is placed across your upper back, and if you have strong rear delts and trapezoids, you can better stabilize the bar without hunching over in the squat. Given all these benefits that rear delt exercises brings along, what are some of the effective rear delt exercises? Below are 6 rear deltoid exercises that will target your rear delts and upper back. See which one works best for you. This rear deltoid exercise has several different variations which are all great for working the rear deltoids. You can use one type for a couple workouts before switching to a different variation. 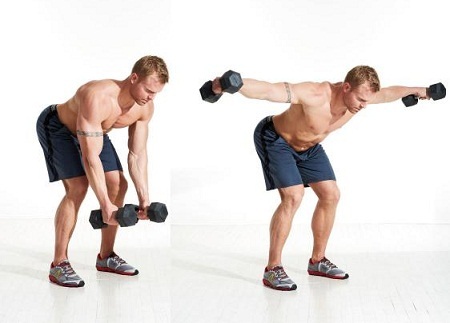 While using dumbbells, bend over at the waist, keeping your feet shoulder width apart. Maintain a slight bend in the knees to prevent unnecessary strain on the lower back. Hold the dumbbells in front of you with your palms facing each other and at arm’s length, keeping a slight bend in your elbows. Using your upper back strength, raise the dumbbells to the back and upwards in a semicircular arc as far as you are able. To maximize the peak contraction in the rear deltoids, hold this positon for a second. When done, lower the dumbbells to the starting position and repeat. This rear deltoid exercise is similar to the previous, except you need to be seated on the end of a bench, using the same weights if you are able. Similar to the two previous posterior deltoid exercises as it isolates the rear delts more. The exception is that you need to lie chest down on an incline bench and it requires use of smaller weights. This is another rear delt exercise similar to the previous, except you lie chest down on a flat bench instead of an incline bench. The same weights should be used as well. This is a version of the rear deltoid lateral raise that works the muscles hard without placing stress on your joints like free weights can. This rear deltoid exercise requires you to use the rope attachment on a cable pulley machine. Start by pulling the rope towards your face, keeping your elbows held high, using either an underhand or overhand grip. Squeeze your shoulder blades together while keeping your chest high to contract your upper back and rear delt muscles. This rear-deltoid focused workout can be performed 2 to 3 days before or after your regularly scheduled shoulder routine. It is important to keep rear deltoid training to a minimum on those days to prevent overtraining. You should maintain this schedule until you notice marked improvement in your rear deltoids, then at that time, these posterior deltoid exercises can be combined into a single workout which you will base specifically on your own needs. It is recommended to start with your 12RM and work your way up to the heaviest weight you can tolerate and keep good form with for eight reps. You need to be sure you can control the weight while working back to the starting point without the resistance pulling you forward. Do two drops in weight after initial failure on your final set, going approx. 20-30 % lighter in weight each time. If your pulleys are fully adjustable, you should begin with the pulleys approx. head level, lowering them on each subsequent set and your final set should be just below shoulder level. Begin with a weight you can handle for approx. 20 reps. While resting no longer than approx. 30 seconds between bouts of work, work to failure as many times as necessary for a goal of 100 reps.